So this is a craps move that is not so obvious other than the fact that you won't hear the dice crack the layout and / or the size of the pastpost bet "SHOULD" alarm some people, especially the base dealer and the box person...however, sometimes, because they don't really know what happened, it just gets paid. So here is the move... The player on the opposite side of the disruptive guy (other side of the stick man) now gets the dice. 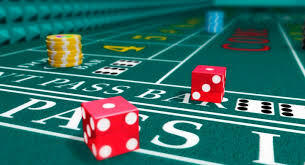 He shoots the dice normally maybe once........all of a sudden, he goes to shoot the dice again, the disruptive character reaches into the base dealer's layout or into the field, and lo and behold, the shooter slides the dice down the table, preferably on aces or ace/deuce...if they are really greedy they will slide them on aces...Why? My take: I love it!...even if I'm a bit confused LOL! I’d like to preface this shot by saying that there is a rule taught to our craps crew that there are NO CALL BETS. Meaning, someone cannot walk up to the table with no money in their hand and CALL for $6 six. 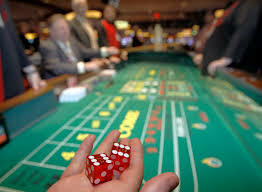 BUT, we also teach them that if you do see the chips/cash, you can book the bet verbally. With that said, "Player Big Shot" walks up to the craps game holding a very large stack of money and CALLS, “Fifty four across” …. the dealer sees the money and books the bet and repeats verbatim … “fifty four across, bet!” The roll is eight. The dealer sets up $12 on the eight and starts to cut out the $14 payout. Player Big Shot says, “Nope, I wanted $5400 across and you owe me $1400!” You could bet that if the roll was seven Player Big Shot would have dropped $54 on the layout and walked away. This went all the way up before it was resolved and they ended up giving him the $1400. The lesson to all dealers here is you must use the word “dollars” when booking any bet. If the dealer would have said, “Fifty four dollars across, bet!” There would have been no shot. My take: I think the game-protection lesson here speaks for itself!